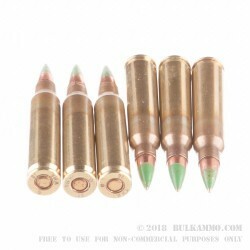 This M855 "penetrator" ammo made by Winchester features a 62 grain SS109 projectile designed to penetrate through light barriers and is a round commonly used by the US Military. 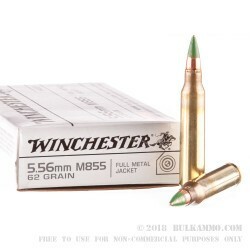 Winchester has a second source contract with the US Military to supply ammunition as a backup behind the government owned Lake City plant which is the largest source of small caliber ammunition for the US government. As part of their contract, Winchester meets a portion of the military's needs and serves as a key contingency tool for national defense. 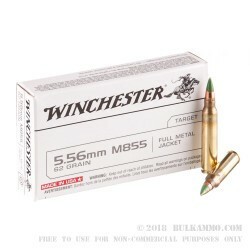 Winchester sells its excess capacity from their M855 military line to the commercial market. 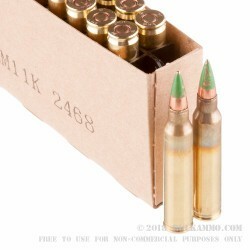 This ammo is a great choice for your AR-15 rifle and is well purposed for target practice as well as for self-defense. Winchester makes their ammunition at their two locations in Oxford, MS and East Alton, Illinois. Q: What are velocity ranges? A: Published velocity on this ammunition is 3000 fps.